Perth, the capital of Western Australia, is the biggest economic and financial hub in the region. The main contributor to the economy of Perth is the agriculture and service and resource industry. Perth has fashioned itself as an economic center in Western Australia as the preferred destination for numerous international companies, mostly IT and private business ventures in diverse domains looking to establishing in the Oceania region. The burgeoning employment market has thrown wide open exciting opportunities for talented professionals to be a part of this highly competitive landscape. Perth is the preferred destination for a number of IT start-ups leading to an exponential increase in the number of job opportunities. There are a number of e-learning options available for professionals keen on updating their knowledge in their chosen specialty to stay afloat amidst innovations in their field. KnowledgeHut offers CSD certification in Perth, designed as a course relevant for professionals looking to make a career in software development in the scrum framework. The online modules of the CSD training in Perth are designed to cover all the latest innovations and includes hours of extensive hands-on training in the field as a certified scrum developer. Our candidates have easy access to comprehensive resources. CCS course in Perth will go a long way towards enhancing your professional repertoire and is a step in the right direction for professionals aspiring for a career in software development. Training provided by KnowledgeHut is designed to introduce candidates to the fundamentals of software development in scrum framework and provides high-quality online training in Certified Scrum Developer certification. 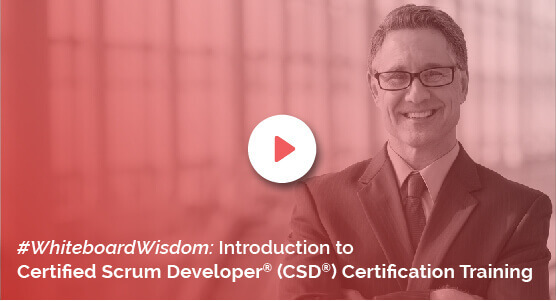 Certification in scrum development empowers candidates to demonstrate superior techniques in software development in the scrum framework. The price of the course offered by KnowledgeHut is reasonable and is a great investment for individuals looking to gain expertise as a certified scrum developer. Attending KnowledgeHut's online classes on Certified Scrum Developer training in Perth will definitely provide our candidates with a competitive edge to stay one step ahead of their peers in the workplace.